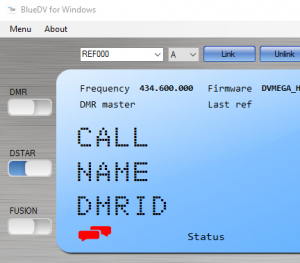 Make sure your enable APRS in BlueDV setup. In the call field, enter the call name of the person you want to chat with. If you want to chat to another BlueDV user add -G behind the call! Enter the text you want to send behind message. When you see the following red message icon, press it and BlueDV APRS chat will be started. Enter your call, Send message to and the message. Keep in mind! Chat messages are public! Be careful what you put in the messages!